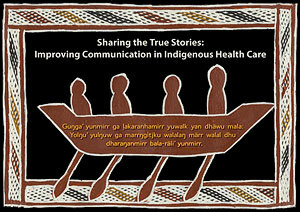 The research project (Sharing the True Stories: Improving Communication between health staff and their Aboriginal patients) was funded by the Co-operative Research Centre for Tropical and Aboriginal Health. The project through which this site was created was funded by the Australian Council for Safety and Quality in Health Care. Additional support was also provided by Jansenn-Cilag and AMGEN. Click here for more acknowledgments. Two Yolŋu members of the project team, Phyllis Batumbil and Helen Guyulun, designed the art work and entry to the web site. The canoe is their metaphor to illustrate the importance of Balanda and Yolŋu working together 'paddling in the same direction'. The aim of this site is to make relevant information on intercultural communication accessible to you when and where you need it. These resources provide an introduction to, and extension of, existing cultural awareness courses and are intended to supplement, but not replace, face to face workshops. Go to this section of the web site to find out more about ways to prevent - or at least minimise - miscommunication in Indigenous health care.